Citizenship as a privilege or as a right: should children be given the vote? At the TEDxWaterloo 2013 Event called chasingHOME I extended an invitation to participate in a conversation about a “crazy” idea: children should be given the vote. Here is the text of my presentation. I would like to invite you into a conversation, a conversation about a “crazy” idea. At least I thought it was crazy when I first heard it. Children should be given the vote. My first response to this idea was as a parent of three girls. Children already have a good deal of power in the home. Any mother fumbling through her purse in the middle of the grocery store check-out line does not need—thank you very much—to be plunged into intense negotiations with the three-year old standing in front of the rows and rows of candy bars placed strategically at toddler eye level. Can you imagine these kids on election day, quietly lined up at polling booths—their purple crayons in hand—waiting to put an X beside the name of a candidate who best represents their interests? When it comes to voting rights societies have always drawn a clear and very sharp line between those who are capable, and those who are not; between those who are informed, and those who are not; and between those who are responsible, and those who are not. And it is clear that children are not capable; it is clear that they are not informed; and it is clear they are not responsible. Their sphere of influence should not extend beyond the home, to acts of politics and the setting of social priorities that affect us all. It is the capable, the informed, and the responsible individual who has the privileges of citizenship, the first and most important being the right to vote. This has been clear for a long time. Mr. Evans, I also imagine, had to raise his voice to be heard because the newspapers of the day reported that his remarks were met by howls of outrage from the many women who packed into the public gallery of parliament that late April day more than a hundred years ago. I suspect that to Mr. Evans, and to many others, the proposal that women should in principle be given the vote must have sounded crazy: after all they were not capable, they were not informed, they were not responsible. And indeed the growing women’s movement always had a strong case to argue that women were as capable as any man, as informed, and as responsible. But on their way to winning the right to vote they also questioned the underlying logic of the conventional wisdom: that citizenship and full participation in society is something that has to be earned. They articulated a different perception of rights: the right of citizenship was inherent in the worth of every individual, and it was the duty of society to recognize this right, not for individuals to prove they were worthy of it. Think of another line that we draw between those who have the right to vote and those who do not: the age of majority. In many democracies citizens under the age of 18 do not have the right to vote. All democracies draw a line of this sort. Yet, nowhere do we draw a line at the other end of the life cycle: we don’t take the right to vote away from citizens who are deemed in some sense to be too old! In the later years of her life my grandmother suffered from certain physical and cognitive impairments: impairments so severe that certainly my 12 year old daughter at the time was much more physically and mentally capable than her, more informed, and more responsible. Yet the idea of taking the right to vote away from anyone over the age of 85 is a crazy idea if we feel that citizenship is a right, rather than a privilege to be earned. The onus is not on us to prove that we are capable, informed, responsible and therefore worthy of citizenship; but rather we have a right that is inherent to us as citizens, and this right creates a reciprocal duty, a duty that governments have to recognize our rights. This too was what women were arguing in the 1800s and early 1900s as they mobilized to get the vote. The howls of outrage that greeted Mr. Evans were also, in some measure, demands that the inherent rights of citizenship should be recognized by those who govern us. The reason that a proposal to give the children the vote might gnaw at us is that it does not sound as crazy if looked at from this perspective. To be certain children are adults in becoming, but they have at all stages in their lives their own interests and concerns that societies in some sense have an obligation to recognize: concerns about home and well-being in the here-and-now, and concerns about the home they will inherit in the future. These shouldn’t count for nothing in the electoral process. But just “how” to make them count is a challenging question. 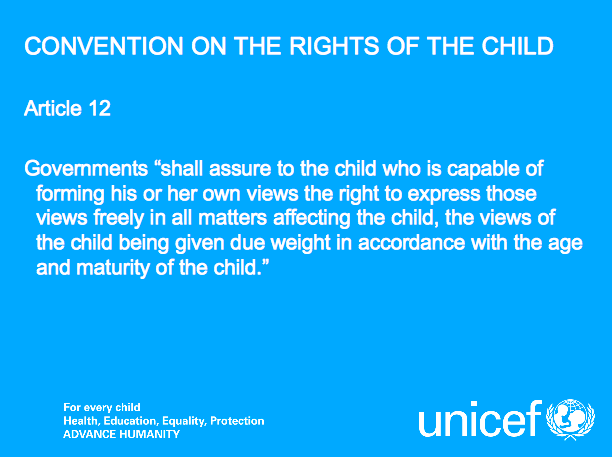 A way to constructively carry this conversation forward might be found in the UN Convention on the Rights of the Child gives some guidance. It articulates the rights of the child in a very broad and comprehensive way, but I would draw your attention to two articles. Article 12 makes clear that there is a duty upon governments to put policies and mechanisms in place that assure children have the right to express their views. Obviously, age and maturity come into play, and so in matters of voting it is reasonable to set an age of majority, be it 21, or 18, or even—as is being discussed by some—16. But this is not to say that younger children do not have a right to vote, only that our duty toward them is imperfectly performed. We need to take some extra steps. For the elderly we take extra steps. In my country, Canada, during elections polling stations are mobile, going to old age homes on election day in recognition that some of the elderly have physical limitations that compromise mobility. Other countries, like the United Kingdom, permit voting by proxy: individuals with, for example, health limitations may not be able to vote, but they can give permission for someone else to cast a vote on their behalf. 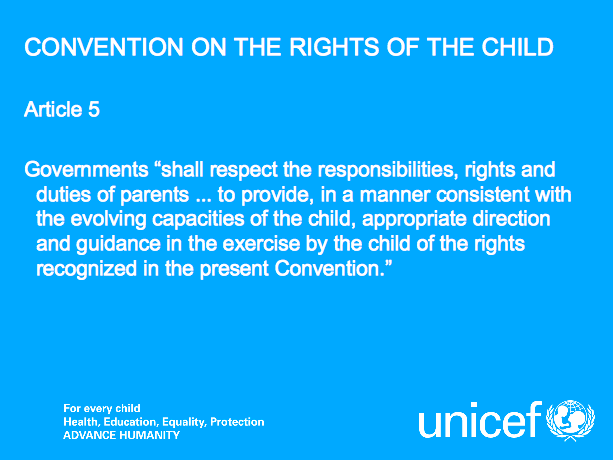 Article 5 of the Convention gives us a hint on how we might take these extra steps for children. It states that parents have the right and duty to give direction and guidance in exercising a child’s rights, and that they should do this in a manner consistent with the evolving capacities of the child. For example, most societies transfer income to parents to keep children from falling into poverty, and it is the parents’ responsibility to spend this on the well-being of children. The suggestion has been made that we do the same thing by transferring political resources to parents in the name of the child. So the proposal I would put to you is that we should recognize the right of children to have the vote, but that this right be exercised by giving parents an extra proxy vote for each child under their guardianship. My home is made up of five Canadian citizens: my wife and me, and our three daughters—a 21 year old, an 18 year old, and a 15 year old—but if an election were held tomorrow we would have only four votes, my youngest daughter not having her rights recognized because she is younger than 18. It is proposed that my wife and I be given an extra vote that we would cast in her name: either my wife would do it, or I would do it, or we would each have an extra half vote, or maybe even my daughter would decide who would do it. This voting scheme has been talked about for almost a century, but more recently it has been called Demeny voting after the Hungarian-American demographer—Paul Demeny—who proposed it in the 1980s. 8. What is wrong with this? It is quite reasonable to wonder about this. It can appear to violate the principle of one person–one vote. Some have suggested that people who do not have children may be put at a disadvantage. Parents may not vote in the interests of their child, and this therefore just privileges some adults over others. This certainly may be true. When we give parents extra money for their children, it is probably the case that some of them don’t spend it in the child’s best interests. But we do it anyways because it probably does a lot more good than bad. Demeny voting is not a perfect scheme, but does that mean we should let the good and feasible fall victim to the perfect but unattainable? Would it take us closer to one person–one vote? Of course, if we do not in a fundamental sense accept that children are persons we would not accept the idea at all. 9. What else is wrong with this? Some children would not want their vote to be cast by their parents. Some teenagers may be particularly well-informed, better informed than their parents. Why shouldn’t they cast their own vote? There are also some regrettable cases in which the home is a dangerous place for children. In cases of abuse, or when children leave the home before the age of majority, should parents continue to cast a proxy vote for the child? For these reasons some have argued that the age at majority should simply be lowered, to say 16 years. But this still does not recognize the rights of younger children. And besides if this is how you feel then would not a Demeny voting scheme bring momentum to exactly this. I can just imagine the look on my 15 year old’s face when she learns that I will be casting her vote for her, and the heated dinner time conversation that might ensue. But isn’t this a good thing, something that would encourage interest in and engagement in the political system? In 1918 the government of the United Kingdom passed the Representation of the People Act that introduced universal suffrage. But in a particular way. All men over the age of 21 were given the vote, and those as young as 19 were able to vote if they had actively served in World War I. All women were also given the vote, that is, all women over the age of 30 who were of property—either their own or their husbands. Well as momentous as this change was, it was not long before parliament passed the Equal Franchise Act, which in 1928 recognized that everyone over the age of 21, regardless of gender and social status, had the right to vote. The conversation on the right to vote has been between a view of citizenship as a privilege, and citizenship as a right. In the 19th century this conversation was about extending the franchise without regard to property and social class; in the 20th century it was about extending it without regard to gender; and in our times it may be about extending it without regard to age. I invite you to participate in this conversation, to participate with a certain wonder about how far it has come, and a curiosity, a curiosity about how our words and deeds will be interpreted by our grandchildren. This is certainly an intriguing idea, and I appreciate your interesting and thorough exploration of the issue. I have forwarded your post to a working group that I support at the National Alliance for Children and Youth which is trying to create a New Agenda for Children, Youth, and Families in Canada. Supporting the UN Convention on the Rights of the Child and providing a greater voice for children and youth is certainly one of our priorities. Thanks, Miles. Yes, I will consider doing that. I have only recently recovered my ability to post messages to your blog. I use Windows XP on my older computer and was encountering increasing difficulties using IE8 on websites that use java, so I have switched to the Firefox browser. Unfortunately, some of my earlier attempted posts were lost in space! One of the projects that I wanted to connect you with is the Gen Squeeze campaign led by Paul Kershaw of the Human Early Learning Partnership at UBC. This is a continuation of their earlier work known as A New Deal for Families and is a narrowly focused communications effort to try to restore some balance in income supports for families and the younger generation in Canada. Attached FYI is the draft position paper that Paul and our group are currently working on to address family policy, along with a pdf summary describing the Gen Squeeze campaign. I believe that there is some intersection with your own concerns about income inequality. I will look for opportunities to share further comments with your readers to future and past posts. Miles, you raise a key point that we have many arbitrary age limits across different laws in Canada that aren’t entirely coherent in the way they provide freedoms and entitlements for young people, from the age to voluneer for the armed forces (younger than voting age!) to the age at which they can make significant medical decisions (also younger than the voting age). Children and youth are a quarter of Canada’s population and do need a bigger voice in decisions affecting them, especially as we shift debt to younger generations and public spending to older generations. There are also other ways to have a say than voting, including Child Impact Assessment of legislative and other key policy proposals, and our UNICEF Bring Your MP to School Day, where MPs hear from young people about the issues that concern them. It’s bordering on George-Orwellian to consider Demeny voting “giving children the vote”. The right to vote means the right to vote themselves. Giving parents more votes only means giving parents more power. To claim any legitimate representation in such scheme, at the very least the child should have the right to withhold the proxy vote, or decide which parent can cast it as you mentioned. Even then, it’s still a very paternalistic system in which children are second-class citizens that can only have indirect and removed voice. If you believe that the right to vote is inherent for every citizen, what we should have is universal suffrage. If anyone is enthusiastic and capable enough to show up and go through the procedure, she should be allowed to vote. No matter what criteria you use to group people, their capabilities will always be overlapping Gaussians. Adults with limited arithmetics and literacy are probably just as incapable as children, yet no one suggests testing them any more. On a side note, dependent tax credit goes back a long time. It is what is, not necessarily what it ought to be regarding children’s rights. If allowed by the society, it may be better to grant children more control over the money that is supposed to be their benefits. Thanks for this Jason. You clearly articulate a perspective that helps me—at least—to put what I was trying to say in my post in a clearer perspective. I was pointing out that the democratic conversation on expanding the franchise has been between those stressing “capability and individual responsibility” and those stressing “rights and social duties”. Looking back on history, its reasonable to suggest that “capability” is used to protect the status quo and limit the sharing of power. And sometimes the emphasis on rights—moreso with respect to socio-economic rights than civil and political rights—is made without regard to individual responsibility and sustainability. It is an interesting conversation, and you clearly come down on one side of it. But I seem to be trying to ride through the middle because I am looking to the the Convention on the Rights of the Child for some grounding of my arguments. If we accept the Convention as a starting point, then we have to recognize “the evolving capacities” of the child. And in this sense, for the case of children, it seems that there is probably more grounds for a compromise between citizenship-as-capability and citizenship-as-right than there is if the issue was addressing voting rights without regard to gender. A Demeny voting scheme seems to be an extra step toward that compromise. So that is why, I think, one can still believe that the right to vote is inherent to every citizen—that there are no second class citizens—while at the same time still accepting an age at majority that signals adulthood and full participation. I guess, upon reflection, my position is stuck to the direction that Article 5 of the Convention is pointing toward. If I were to let go of that Article as a starting point, then I guess I would have to accept your argument. Thank you Miles for your reply. It’s true that I have multiple reservations regarding UNCRC, even though its interpreted implementation would probably still be an improvement over the status quo. The most fundamental issue of UNCRC is that children had no role in its elaboration, so what’s codified is really just what adults were willing to grant. It cannot substitute what children claim or assert, presently or potentially, as their rights. Unfortunately UNCRC is too often claimed to be of universal validity, and developments that break further from the modern, western conception of childhood are largely ignored. The unions of working children like MOLACNATs are probably the best example. If you are interested in alternative perspectives to UNCRC, I would recommend Manfred Liebel’s books especially “Children’s Rights from Below: Cross-Cultural Perspectives”, and Robert Epstein’s work on adolescence.